The Bass Line 2 is the follow-up to 3YO3's first metal model, the Bass Line. 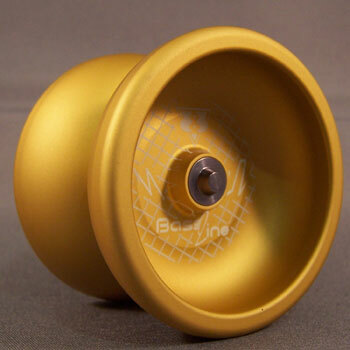 Machined in the USA by Landon Balk, and finished with a unique Charcoal Blast finish that leaves the yo-yo feeling incredibly soft and smooth. The Bass Line 2 uses the One Drop Side Effect axle system and ships from the factory with flowable silicone response, but can use One Drop Flow Groove pads. Comes in an attractive wooden/leather box, and is shown here in the "High Roller" gold color.